There’s a funny thing about Colias Eurytheme. They are in our gardens, parks and downtowns. We see them all the time, but fewer than 1 in 100 people will be able to tell you their name. They live among us in nearly total obscurity. They are fun to follow, but in flight, soon zoom away. 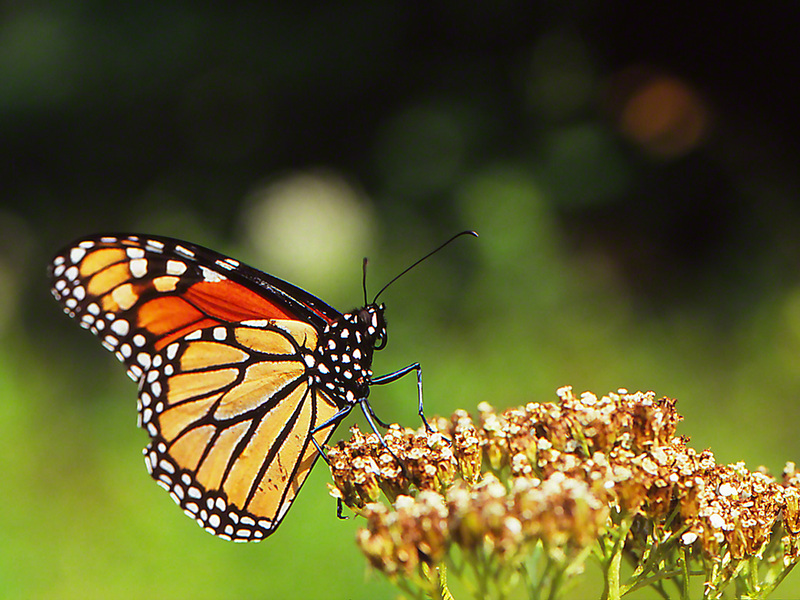 Female butterflies search for flowers with nectar and for males seeking females. When I began seriously photographing butterflies many years ago, I thought that these orange sulphurs were the dumbest of the lepidoptera. Why? Because they flew like maniacs, flying here, there, here again and then speeding down the trails for the next rounds of here, there, here again. I now understand that those ‘maniacs’ were in fact not purposeless goofs, but instead they were males, methodically searching for mates. In fact they were tirelessly flying for hours, and only briefly resting once in a while. The female butterfly in this photograph is frontally lit, and the light nicely displays her beautiful wings. She’s in a great place, the Outdoor Gardens of the Phipps Conservatory. Phipps is a nirvana for butterflies looking for nectar. You might be wondering, “How do they get through our rough winters?” The answer is that pupa remain hidden and revision of their fluids enable them to survive. Neat, huh? Rain fell during the winter months in southcentral Arizona. 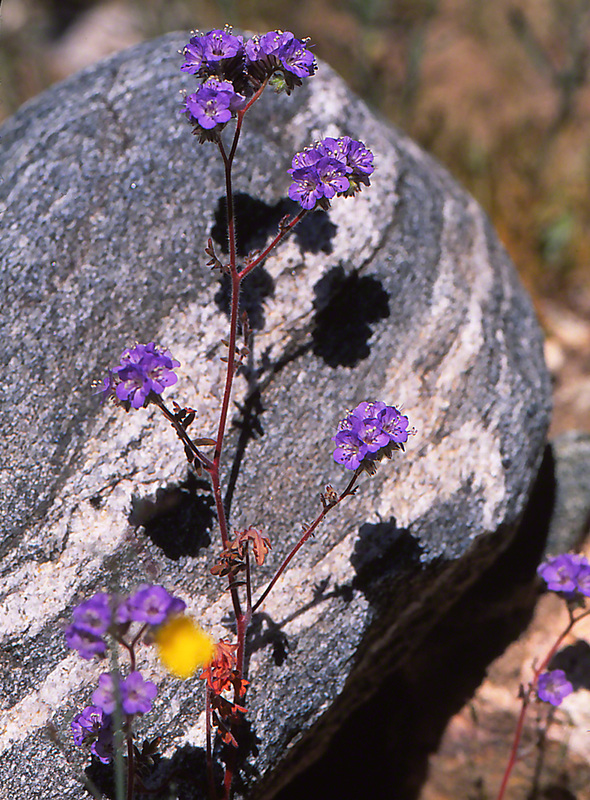 Media reports forecasting potentially spectacular wildflower phenomena in March and April triggered good memories of stalking butterflies in the cs of White Mountains Regional Park. The park is just 30 minutes from my family in Sun City West, Arizona, so I pushed the “Go” button and booked my flight. What beauty awaited me!. Wildflowers were everywhere, carpeting the hills, mountains and arroyos. Colors were rich, blanketing everything in every direction. This image represents the vivid contrasts presented in those arroyos – the stark, rich hues against rock with dramatic, eye-popping personality. The butterflies were out and about. Yes, they were flying and drinking nectar with glee! But this time they had to share my attention with the wildflowers and infinite 360 degree panorama. In southern Arizona, be mindful of the heat. Get there at 6:30 AM and leave NLT 10:00 AM. We share with you one of the most fascinating butterfly images that I have ever photographed. In real terms, this is one of the 50,000+ slides we’ve processed. It is one among the most enigmatic in the collection. This Danaus plexippus female butterfly was resting on a wilted flowerhead in Nichol field in Raccoon Creek State Park in Southwestern Pennsylvania. There may have been a bit of damage to the margin of her hindwings, but she was otherwise intact and beautiful. It was 10:20 A.M. on a sunny morning, and I decided to attempt to photograph her. I made my patented, methodical approach. Take a look at the Technique feature for more details. 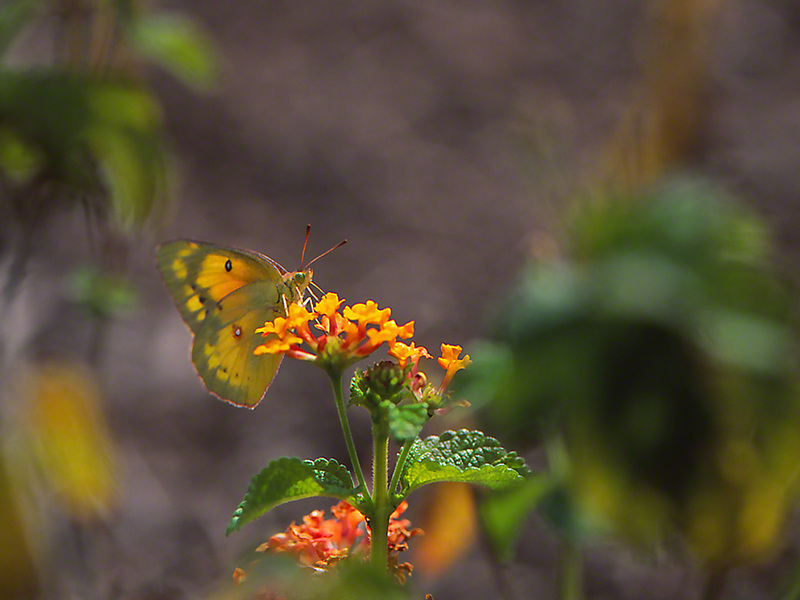 I was within excellent range for my macro lens– just 12″ away from the butterfly. She remained in place and did not flee. What happened next continues to puzzle me. Why? Because I have approached several hundred thousand butterflies over the years and I have never seen a butterfly do exactly what this one did. I recently attended an international Congress of lepidopterists and when a researcher presented his study of butterflies and their ability to respond to visual stimuli, I noted this experience during the Q and A interaction – but without much response. What happened? She turned her head to her right, and looked at me. She paused. She fled. I have never seen a butterfly turn its head before or since. I didn’t know that their heads could move to the right or to the left. When she had flown away, I stood up and truth be told, puzzled over it.